Overall electricity generation in Germany will decrease from 625 terrawatt-hours (TWh) in 2010 to 590 TWh in 2020. This change is attributed to energy efficiency measures and increased imports that will replace the supply lost from nuclear power sources. Despite the fall in overall electricity generation, Frost & Sullivan predicts an increase in installed capacity from 153 gigawatts (GW) to 179 GW in 2020. This will be mainly due to the growth of solar and wind resources. However, from now till 2020, coal will remain the leading fuel – 37 percent of generation – but Germany will experience a decline in lignite-fired output as older power stations are decommissioned. Germany’s share of gas will also see an increase through an accelerated development program – though greater shares anticipated post-2020. LONDON, Feb. 22, 2012 /PRNewswire/—The energy market in Germany will see dramatic changes during the next few years. With the nuclear energy capacity halved, the landscape to 2020 will look very different with renewable energy to account for 36 percent of electricity generated. Frost & Sullivan’s Energy group forecasts that overall electricity generation will decline from 625 TWh in 2010 to 590 TWh in 2020, due to energy efficiency measures and increased imports (which will be needed to fill part of the gap left by the nuclear plant closures). However, the installed capacity is set to rise from 153 GW to 179 GW in 2020. This is mainly because of the growth in wind and solar, both of which have relatively low availability and need to be supported by back-up power such as gas turbines. For what concerns renewable energy, solar and wind are set to play a big part in future. 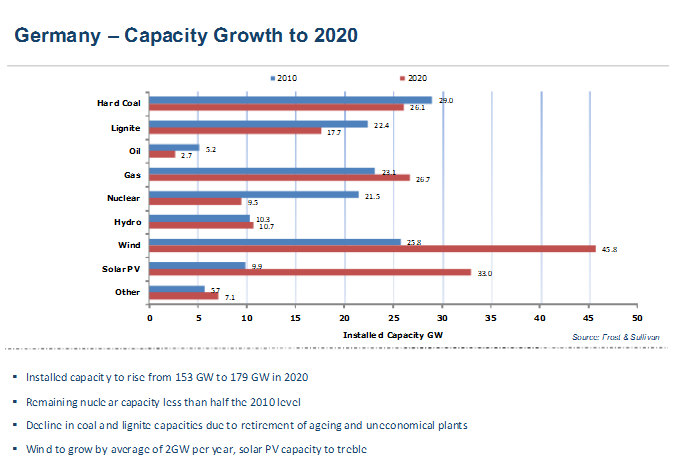 Solar PV capacity is forecast to treble while wind will grow by average of 2GW per year. Massive change is forecast for solar in particular – renewable energy to account for 36 percent of electricity generation by 2020 (aim of EEG is to raise renewable energy share to at least 35 percent of gross power consumption by 2020). Energy efficiency will play an important role in the reduction in demand; the Energy Efficiency Act (EnEfG) sets target to reduce energy consumption by 9 percent in 2020, in comparison to consumption 2001-2005. “Energy efficiency will be a big topic in 2012, as the EU moves towards forcing Member States to take action. The voluntary approach adopted in 2007 has largely failed, with minimal energy efficiency gains in most Member States. As usual in these matters, Germany is already leading the way, but it is likely that more will need to be done,” adds Robinson. However, from now till 2020, according to Frost & Sullivan, coal will remain the leading fuel (37 percent of generation) but Germany will experience a decline in lignite-fired output as older power stations are decommissioned. We will also see an increase in share of gas through an accelerated development programme – though greater shares anticipated post-2020. “Germany has of course always been a key market for power generation equipment, but there is now the need for across the board investment in generation, transmission and distribution. This creates interesting opportunities for equipment manufacturers and project developers,” concludes Robinson. Log in | 79 queries. 1.200 seconds.